TORQ-fuelled and tuned, ultra endurance cyclist, Mike Cotty has been at it again! After his epic 666km crossing of the French Alps in the summer of 2013, Mike has raised the bar again and dreamt up ‘The Road To Mt Blanc’ his longest and toughest journey to date. “The high mountains are a mysterious and unpredictable place offering a moment of escapism to experience life amidst a journey of new and unknown limits. Somehow, after riding nonstop across the Pyrenees in 2011 and the French Alps last year, I now find myself facing the daunting prospect of undertaking my toughest challenge yet – a 1,000 kilometre, 21 climb monster with over 23,000 metres of elevation across the Dolomites, Eastern Alps and Swiss Alps that’s affectionately known to those in the inner circle as The Road to Mont Blanc .and if you’re reading this then you are firmly part of the inner circle. Welcome. It’s your own reflection that makes you realise just how much of your soul belongs in the heart of what you truly believe in. That’s the essence of exploration. It’s a beautiful metaphor for life. I mean, if you don’t try how will you ever know? Quite how I’ve actually made it to this point sometimes eludes me. In some respect, I guess it’s all part of the evolution of growing old, the years roll by and it’s only when you take a second to breathe that you can retrace the road at which you’ve travelled along. Exploration opens up a whole new world beyond physical and mental expectations of one’s self. Despite years of training, sacrifice and preparation there really is no certainty as to where or when the limit will occur”. On August 4th at 1pm (GMT+1), Mike will depart from Conegliano, Italy, on route to Chamonix, France, overlooked by the iconic Mont Blanc. Faced with the daunting prospect of tackling the Dolomites, Eastern Alps and Swiss Alps back-to-back, the challenge will see Mike attempt to cover 1,000 kilometres, 21 mountains and over 23,000 metres of elevation, crossing some of the world’s most famous passes including the Giau, Falzarego, Pordoi, Stelvio, Gavia, Bernina, Splügen, San Bernadino, Oberalp, Gottard and Neufenen on his journey towards new and unknown limits. TORQ will be fuelling Mikes epic adventure and we wish him all the best of luck with the ride. 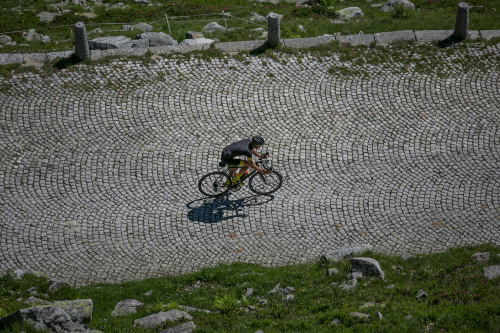 You can follow Mikes ride live via his Map My Track Event Page and via Mavic’s Twitter and Facebook pages or by using the hashtag #Road2MtBlanc.